We all know the basics for raising healthy chickens: feed, water, shelter, and warmth. 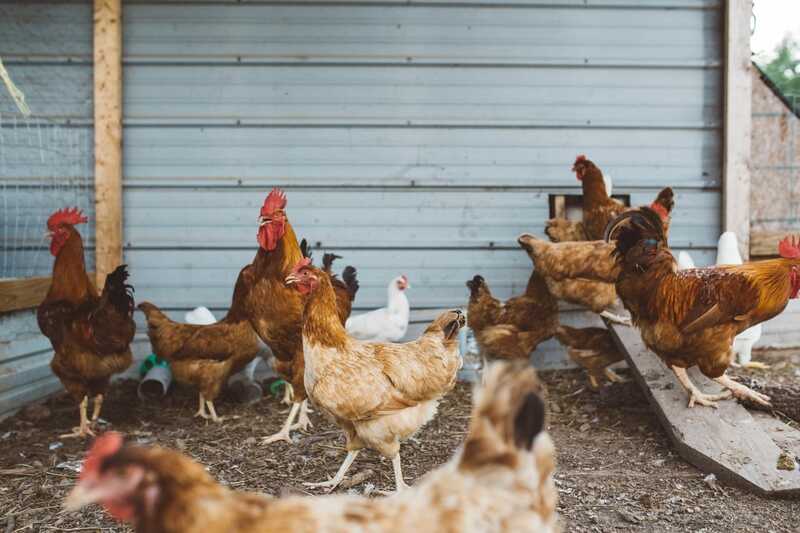 However, there’s one essential aspect of good poultry management that is often overlooked, and it’s right under your feet—bedding. Properly managed bedding (or litter) is another area that is key to keeping healthy chickens. Luckily, proper bedding management only takes a few simple steps. All bedding, regardless of animal species, serves a few simple purposes. First and mainly, it absorbs and releases moisture. Secondly, it provides footing for our animals. Third, it holds warmth. These are beneficial for our chickens. However, there are some things that bedding also does that are not so beneficial. Our bedding can harbor billions of bacteria, and while most are beneficial some can be very harmful. Bedding can hold parasites, that can survive in bedding from one flock of birds to the next. Bedding that has too much moisture can cause paw/foot pad burns. Gases such as ammonia can be released from improperly managed bedding. Fortunately, through proper management we can reduce the risk of any of these bad things happening. Let’s look at some of the important factors that make a good litter or bedding material. Bedding or litter for animals can be comprised of many different materials. Most often it is wood chips from either soft or hard woods, straw, pellets, sand etc. The reason these materials are used is their ability to absorb and release moisture, and availability. What are some of the materials? Wood shavings from soft woods such as white pine are generally the most common and regarded as the best bedding material. Unfortunately, the price for pine shavings has increased drastically in recent years due to increased demand. However, research has given us some alternative materials that will work. Sawdust has proven to perform well; but, it does have two drawbacks. Litter consumption can increase and it has an increased chance to contain aspergillosis organisms. Chopped wood pallets, after being used for shipping, are a good alternative. Caution must be taken when using recycled wood pallets, though, as they may be contaminated with toxic materials if the pallet carried things such as fuels, pesticides, or solvents. Care should also be taken to check for any nails. Regionally, rice and peanut hulls, and ground corncobs can work if you live in an area that produces these crops. Sand can also work well, and if managed properly can last for years. Research has even suggested that sand can improve some performance characteristics, i.e. feed conversion, growth, and pad quality. Some materials that maybe available but that shouldn’t be high on the list to use as bedding material are chopped straw, shredded paper, and pine straw. While these three materials will work, their management can be more labor intensive than the other materials listed. A word of caution is needed here: While cedar chips and other hardwoods may smell nice, they should not be used for bedding material. These types of woods are prone to being contaminated with a fungus that can infect your chickens and lead to disease and eventual death. Damp, dry, or just right? Luckily there is an easy way to determine your litter moisture without having to buy any equipment. All you need to do is grab a handful (preferably with rubber gloves on) and gently squeeze it into a ball. If the ball crumbles quickly without clumping then your litter is very dry; if the ball clumps and then crumbles slowly your litter does have some moisture in it. If the litter clumps and stays together, your moisture level is getting too high and is on the verge of becoming cake. The moisture level you should aim for when chickens are present is slightly moist—you would like for it to clump loosely and then fall apart. If you feel like your litter has gotten too wet, there are some steps you can take to help it dry. First, you can simply add more bedding on top. Another good solution is to increase air flow through your coop. Increased air flow will help the moisture evaporate from the litter, it will also get some of the ammonia out that will come with increased litter moisture. If your litter has gotten to the point that it has formed cake, you need to remove it. Cake is hard, so you can pick it up with a scoop or shovel and easily remove it. Some may suggest breaking the cake up while it’s inside the coop, but that action can release the ammonia that has been trapped inside the caked litter. I like to think of cake as a bomb, and that should be handled with great care. If you need to dry your bedding then you can either let it sit in the coop with no chickens for a week or so. If you have new chickens or cannot have an empty coop, you could remove the bedding from the house and simply cover it and let it dry. Now, let’s look at how bedding material can help hold in heat. Good bedding material will have low thermal conductivity, basically how fast heat moves across a material. Insulating material has low thermal conductivity, and fortunately you can use this to your advantage. Think about how soil always feels cold. While not a so much of a problem in the warmer months, being on a cold, frozen ground wouldn’t be very comfortable in the winter. A good three to four inches of bedding material will serve as excellent thermal insulation and hold heat during cold months or when brooding young chickens. Unfortunately, improperly managed bedding can make some very bad things can happen. Chicken excreta is loaded with bacteria, parasites, and any other microbes. When chickens defecate onto the bedding, they are depositing millions of these microbes every time. While 99% of bacteria are harmless or beneficial, there are some that are very bad. Namely these bacteria associated with chickens are Salmonella, Campylobacter, Staphylococcus, and Clostridium perfringens. Some can cause infections in humans, while some can cause serious infections in your chickens. 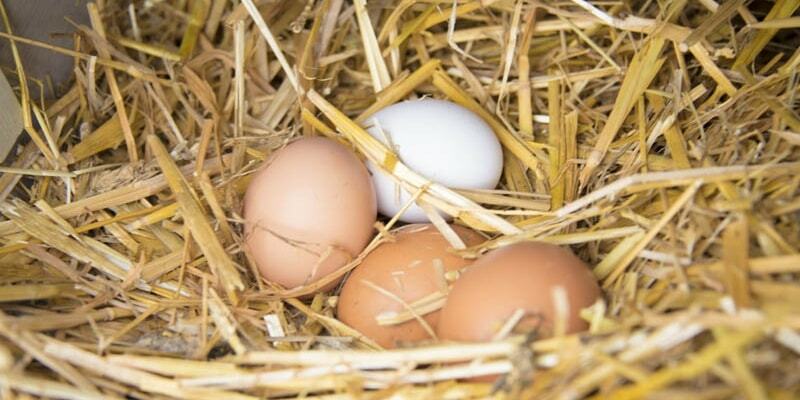 You’re probably thinking, “How on earth can I help prevent these harmful bacteria from living in my coop bedding?” Well, there are a couple of things you can do. A regular clean-out or just removing the top portion of bedding will help control moisture levels. Research has shown that 99% of all bacteria in chicken bedding live in the top two inches. If you choose to do this, you should add some bedding material back on top of the old bedding that is left. Another option, and something that at some point you will have to do anyhow (because let’s face it, chickens poop a lot) is to compost the bedding. During composting, we are utilizing the bacteria in the bedding to create heat in a compost pile. This heating can kill and significantly reduce the number of microbes present. To make a compost pile you can either pile the bedding in the coop—a good choice if you aren’t going to have chickens for a while—or you can remove it and use a compost bin. A compost bin is simple to build: You just need a square wooden structure, with walls three to four feet high on three sides. One side should be left open so you can work the compost. The pile will need to be at least three to four feet high in the center. Depending on the wetness of your bedding you may have to add some water. A good compost pile should be fairly damp, i.e. squeeze it into a ball and it should crumble slowly. After you have built your compost pile, the next step is to see if it is working. To determine if your compost pile is working you will have to take its temperature. You can buy a compost thermometer for roughly $20 online or in most gardening stores. The pile should top out around 140 to 150 ℉. Once it reaches this temperature you need to let it cook for a few days to really start to kill off the microbes. After the pile has gone through a heat, you can turn the pile, simply you need to swap the material on the inside with the material on the outside. Then the composting process will start over. There a few things that can go wrong but these can be easily fixed. The usual problem is that the pile does not heat up. The most common causes of this are not enough moisture to activate the bacteria, or the pile is not deep enough. These are simple enough to fix. Another problem you might face when composting is a bit harder. Composting is an aerobic process, in other words the bacteria must have oxygen to compost, otherwise you can get mold and rot. If you notice mold in your compost then you need to get more air into the pile, you can turn it over and see if it helps. Another good way to get air flow is to make a base of fresh wood shavings and then putting the compost on top of that. The good news is that properly composted material can be reused as either bedding again or fertilizer and is perfectly safe. As you can see, that bedding management isn’t complicated or a great mystery. Good management just requires a little forethought to select proper material, a little care when you have chickens (i.e. maintaining moisture), and properly managing the bedding between flocks of chickens or when it leaves the coop.